Real coutryside, very peaceful near to Siena. 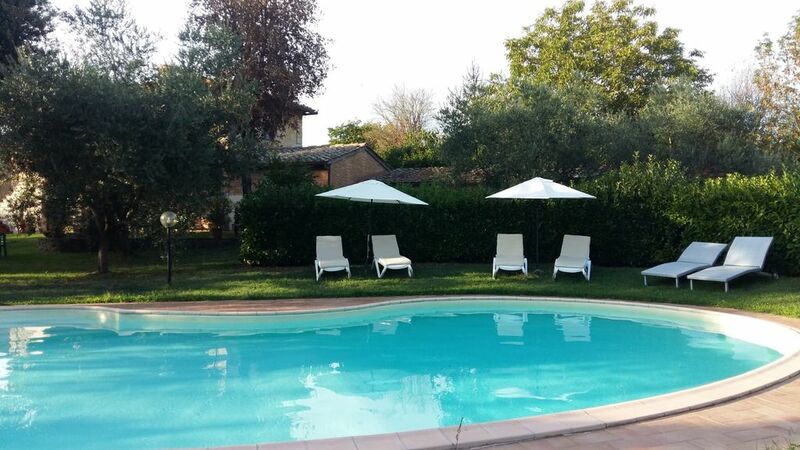 With private swimmingpool and a wide garden that surrounds the villa. The garden is amazing with a pristine pool, an open charcoal bbq area, a hammock and the pergola for meals. The house is beautfully restored by Patrizia’s father and has wonderful beams and character. Patrizia and Valoria are kind hosts. We loved staying here. The owners were great to deal with, they paid a lot of attention and we received prompt response to our emails and queries. The villa was comfortable and spacious for the four of us. The unlimited wifi was very good. The pool was large and was cleaned regularly. And the location was perfect for short visits to Sienna and easy to get to. There was no air conditioning but the ceiling fans and open windows with nets ensured the property remained cool. All in all a fantastic experience and highly recommended. We hebben met 6 volwassenen en een kind 10 fijne dagen doorgebracht in dit prachtig gelegen huis. De eigenaren zijn heel aardig en behulpzaam. We hebben genoten van het zwembad en natuurlijk de mooie omgeving. Location tout confort recommandée sans hésitation pour famille ou couples d'amis (7 couchages). Maison très calme, idéalement située à 20 min de Sienne, avec jardin et piscine très agréables. Seul petit bémol, équipement de la maison plutôt sommaire mais qui ne gâche pas le séjour. Sehr freundliche und zuvorkommende Vermieter, freundliche Nachbarn, gepflegtes Anwesen. Tägliche Säuberung des Pools. Ein kleines Stück vom Paradies.